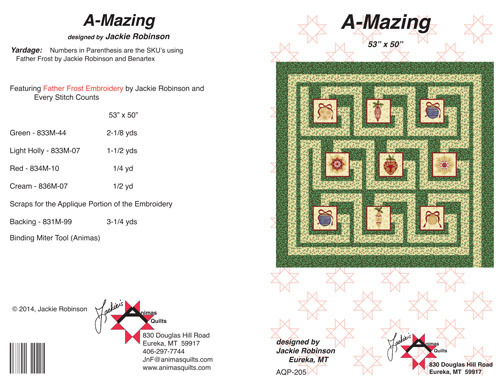 Jackie Robinson, founder of Animas Quilts, is an international teacher and lecturer and the author of over several quilt books including Jo and Erika’s favorite – Quilts in the Tradition of Frank Lloyd Wright. Some days I really don’t know what I’m thinking – or more specifically – IF I am thinking!! Though this journey (which is far from completed) has been a hoot. I’m honestly loving it – every step of the way. And – some of those steps have been mighty interesting! I’ve never had an interest in owning a machine that would do lovely embroidery. 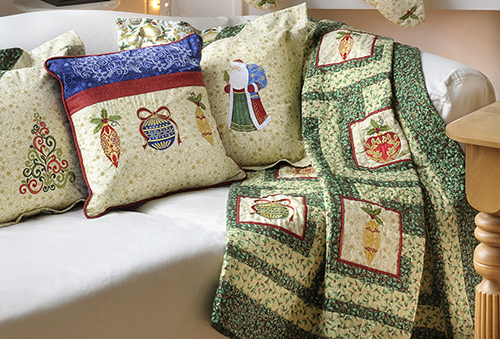 Let’s face it – I’m a quilt piecer, and a designer of pieced quilts, and a designer of fabrics for Benartex. Embroidery has just not ever reached my crystal ball. Add to that my two “adult” children (42 and 39) have not produced any offspring, so I’ve never had the typical Grandma urge to make fabulous things for outstanding grands. Until last summer . 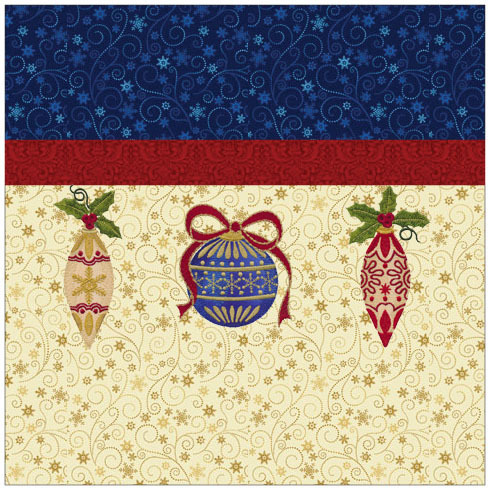 . .
One of the sister companies of BERNINA, Brewer Quilting & Sewing Supplies, decided to have another of the sister companies, OESD (Oklahoma Embroidery Supplies and Designs) digitize a fabric collection I had designed with Benartex (another sister company of BERNINA). 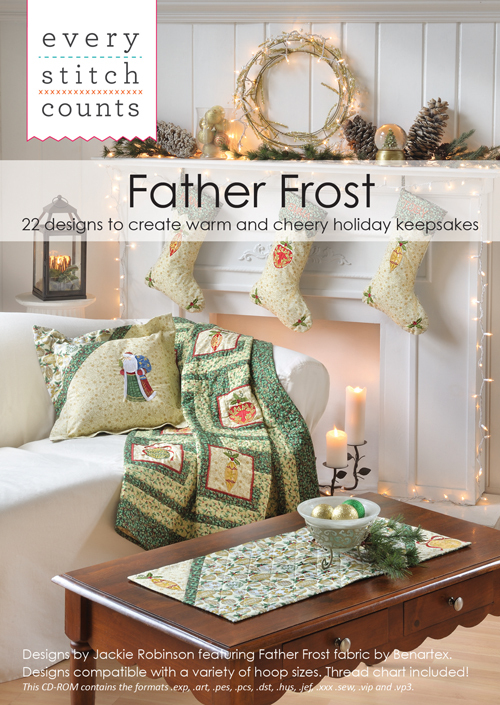 So the Every Stitch Counts Father Frost collection started the embroidery machine ball rolling. It just seemed to me that I should stitch all the samples I’d be sewing to support the embroidery. Silly? Maybe. Fun ? YES ! I got my wonderful BERNINA 830 on February 17th. What was left of February disappeared with moving my Mom from one care center to another, and the packing, etc. that downsizing took. And then shortly thereafter I left on a previously planned vacation. So, in all fairness to this project, it really didn’t get cranking until March 16th. Here’s what happened between then and March 24th, only ten embroidery-full days later, along with a bit of what I’ve learned, and the obvious of what I still need to learn . . . .
First I made the 9 blocks (6″ squares) for the A-Mazing Quilt. It’s titled because of the maze the log cabin variation produces. Actually, I made it twice – as I’ve done with everything – as the software people would like two sets of samples. The 6″ blocks were pretty easy. Most fit in the medium hoop, and they just happened, with all of their thread changes <g>. 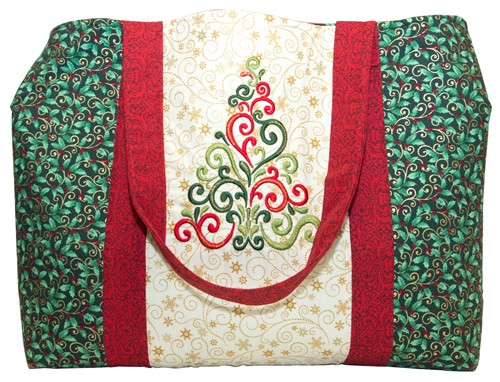 Then I thought it would be great to stitch out the fabulous tree. I’m using it on the tote bags, and on one of the pillows. Not too bad. Need five total. Stitch, stitch, stitch, . . . love it. All the time the machine is running, and I’m jumping up and down with thread changes, I’m also trying to get the previous project pieced on another machine . . . . 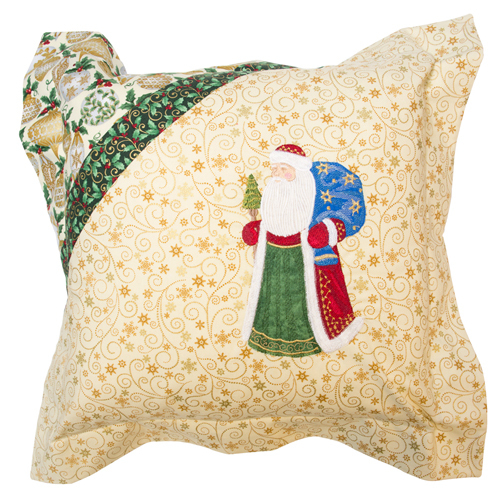 So, with the pillows on a roll, I got to stitch out one of the Santa figures. I REALLY like him, even though most of this project is about the ornaments. 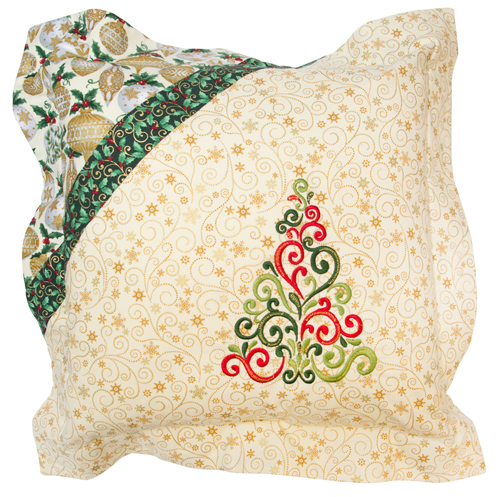 In the pillow pattern there are two different pillows. 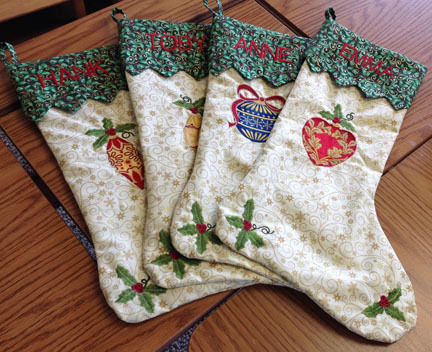 One of them features a line-up of three of the ornaments. Hmmm. I sure do want to stitch them out together – one hoop, etc. So, into the software I go, where I loaded all three. Yippee! It worked! I could even rotate them 90° so they’d all easily fit in the Jumbo hoop. Hey, we’re rolling now! Make two, of course. 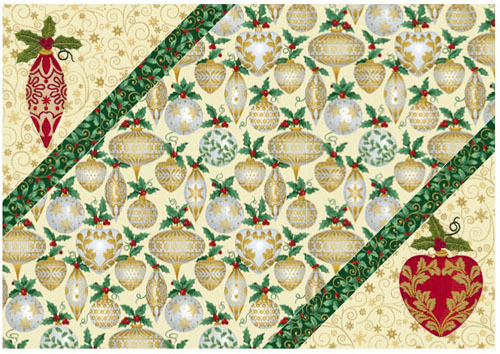 The upper part of that pillow uses line art – I think I’ll think about that tomorrow (as Scarlett would say), so the trio of ornaments STITCHED ON THE PILLOW? decorated my sewing station for over a week while I plowed forward. 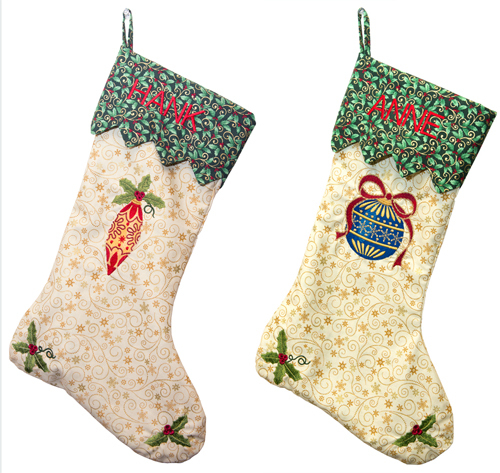 The stockings have embroidery in three places. Finding the center for the main one –that was fairly easy, and quickly I figured out how to turn and position the heel and then the toe in a hoop to get the holly shapes where I wanted them. Meanwhile pondering . . . I’ll bet I could have put both hollys in one hooping! That would be done with the software –right? The placemats and table runners provided the largest hurdles for me to cross. It’s good that my math skills are strong –I was finding centers on the two triangular parts of each square – after allowing some extra. Hmmm… I’ll bet the fancy software would have placed them BOTH for one hooping. Note to self – learn that software! After my embroidery play I began quilting the tree line art on a quilt due to be sent to McCall’s, and removed the embroidery module from my machine to start the quilting of the A-Mazings. But embroidering has been a HOOT! I was MORE! I would buy this embroidery just for that tree. I love it.